"The art of immobilizing the opponent in a way that said ship is unable to move"
Tackling is the act of pinning down a ship so that it cannot escape. Tackling is the backbone of PvP in EVE, as ships that are not tackled will likely be able to warp out and disengage before they are destroyed. Tackling is usually accomplished using modules such as Warp Scramblers and Stasis Webifiers, but there are a variety of modules that can either slow down enemy ships or disable their ability to warp. Though tackling usually refers to the combination of stasis webifiers and warp disruption, warp disruption is the necessary ingredient that distinguishes tackling from simply slowing down opponents. A tackler, then, is a pilot whose job it is to pin down a ship so that other players can kill it, though this term can also be used to refer to a ship fit for that purpose. Tackle ships are generally not fit to deal significant amounts of damage (if any), but battleship fights without tacklers usually end when the side whose shields drop just warps out. This means that it is the tackler who facilitates kills, and for this reason tacklers are included on kill mails. Without one side being trapped, it's very rare that a given fight will end with a ship kill. Tacklers also serve as the backbone of fleet operations, and fleet commanders will generally prioritize effective deployment of fleet tacklers under their command. 3.1 Warp scrambler or warp disruptor? 3.3 What type of tank? 3.4 To fit a stasis webifier or not? 3.5 To fit a sensor booster or not? 3.6 Long range or short range weapons? 3.7 Tech 1 or Tech 2 modules? 3.8 To fit electronic warfare modules or not? First Tackle: The job of first tackle is to be first on the scene and to hold the target so that they can't warp away. This also means they are normally the primary target for the person they are trying to tackle, because they represent a threat. This role is often filled by an interceptor, but a Tech 1 fast frigate can also be used. Second Tackle: In a fleet situation, this is "everyone else". Second tackle's role is to grab the ship tackled by first tackle and slow it down so the damage dealing ships can join the fun. Once two or three second tacklers have the ship, it is basically dead in the water and the heavier ships can either catch up or warp to the tacklers. Heavy Tackle: Heavy tackle ships are ships fit for high survivability, capable of holding down targets for extended periods of time. They are usually ships with bonuses to webs or warp disruption. Heavy Interdiction Cruisers often fill this role, as they can not only use interdiction bubbles, but can also scram and point from long ranges. They are also uniquely suited to tackling supercapitals due to their high warp scramble strength ("infinipoints"). Gate Tackle: Gate tackle is a specialised form of tackle, where the emphasis is not on speed but on lock time. Their job is simply to get a lock and point as fast as possible so the target cannot warp off, and then the rest of the first tackle locks them down. Some gates, such as regional gates, are particularly large, and often require two or three gate tacklers to completely cover them. Some speed is useful in case the target tries to burn out of range, but not all important as it is for first tackle. Tank can also be lighter, as they are operating with the rest of the fleet. There exists wide variety of modules designed for stopping your target from escaping. These modules will either stop your target from warping away, slow down the target ship or stop them from using micro warp drives or micro jump drives. Comparison between grapplers and webifiers. The T2 grappler is superior to T2 web when the target is within 8km range. Click to enlarge. The warp disruptor (also called "point" or "long point") does what its name says: it makes the opponent's ship unable to warp away. This will disrupt the warpcore of the opponent's ship. The basic range of the warp disruptor is 20km for a tech 1 module and 24km for a tech 2 module. The warpcore disabling strength for this module is 1 point. The warp scrambler (also called "scram", "point", or "short point") works on same basic principles as the warp disruptor, in that it will disable the warpcore of the opponent's ship. But warp scramblers also disable the opponent's microwarpdrive, even when the amount of warp strength in the target ship (which can be boosted by fitting warp core stabilizers) exceeds the strength of the scram. Having two or more warp core stabilizers will counter the scram and allow the target to warp, yet the microwarpdrive still won't work. The basic range for a warp scrambler is significantly lower then that of a warp disruptor. For a tech 1 module the range is 7.5km and for a tech 2 module the range is 9km. The warpcore disabling strength of this module is 2 points. In addition to stopping warping the warp scrambler stops the ship from using micro jump drives, micro jump field generators and micro warp drives. This makes scramblers vital in catching certain fits. The Warp disruption field generator is a specialized warp disruption module that can be used in three different modes: unscripted, warp disruption scripted and warp scrambler scripted. In all modes this module has infinite strength so no ammount of warp core stabilizers will help. This module can only be used by heavy inderdiction cruisers. In addition to stoping warping this module with scripts stops capital ships from taking gates. When used for bublles this module allows the ship to tackle ships without targeting them. Without scripts this module forms a warp disruption bubble and is limited to null security and wormhole space only. See § Warp disruption fields for details. With warp disruption script it works as a warp disruptor module with increased range and infinite strength. This can be used everywhere. With warp scrambling script it works as a warp scrambler with increased range and infinite strength. Like the normal scrambler this also stops the target from using MJD, MJDFG or MWD. This can be used everywhere. The Interdiction sphere launcher is used for launching warp disrupt probes. This probe creates a warp disruption bubble that lasts for two minutes before collapsing. As the field is an area of effect warp disruption method this module works even if the ship is unable to target the target. The probe is also completely independant and will keep the bubble up even if the interdictor is destroyed. This module can only be used by inderdictors. See § Warp disruption fields for bubble mechanics. The stasis webifier (also called a "web") is different from the warp disruptor and the warp scrambler. The stasis webifier focuses on decreasing the sub-warp speed of a ship. The sub-warp speed is the speed that you normally fly around at. The sub-warp speed reduction depends on the version of the module. The tech 1 version causes a 50% speed reduction, the tech 2 version causes a 60% speed reduction. Both modules have a maximum range of 10km. While tackling someone, a tackler should always use a warp disruptor or scrambler before the stasis webifier. Reducing the top speed of a ship with a web will make it easier for the target to warp away because they can then more quickly reach the 75% of top speed needed for initiating warp. So point first, then web. The Stasis grappler is the big brother of normal stasis webifier. It has much greater velocity modifier than the normal webifier. 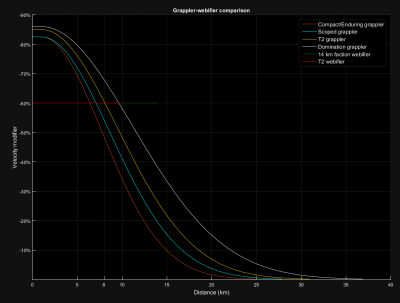 But unlike stasis webifier the grappler has only 1 km optimal and a 8-12 km falloff range. The strength of applied effect is reduced using same formula as turret hit chance. Meaning that at optimal+falloff range the applied slow down is only 50% of the maximum modifier. After optimal+falloff the effect of this module drops very rapidly. The grapplers also have hard limit of Optimal+3×Falloff beyond which the module can not be activated even though it would still have small 0-2% velocity reduction. The grappler also requires hefty sum of powergrid and can only be fitted on battleships and above. Support fighters can also provide Warp Disruption and Webification. The Gallente Siren series support fighters provides 1 point of Warp Disruption per fighter, the Minmatar Dromi series support fighters provides -15% Webification per fighter (additive). Warp disruption field is an area effect that stops all ships within it from using their warp drives. This field has effectively infinite warp disruption strength and no amount of warp core stabilizers will allow you to warp. Warp disruption fields can only be used in null security space and wormholes. Because of its appearance, warp disruption fields are commonly referred to as "bubbles". Warp disruption field generator on a heavy interdiction cruiser. The warp disruption field generator instantly generates a bubble centered on the ship. This also massively decreases ship mass and reduces its maximum speed. Inderdiction sphere launcher on a interdictor destroyer. is used for launching an warp disrupt probe that instantly creates a warp disruption field near the launching point. The destroyer that launched the bubble is free to move but the bubble lasts for two minutes. Mobile warp diruptor structures come in varying sizes from small (5 km radius) to large (40 m radius). These structures can be deployed in space but it takes two minutes time until the structure creates the bubble. They also have their own structure, armor and shield HP and can be destroyed by shooting at them enough. They also decay on their own if left in space for several days. Their use is limited to null security and wormhole space. Any ships within its area of effect cannot initiate warp, and capital ships cannot use their jump drives. Ships warping nearby may be “dragged” out of warp. Imagine a line along which you travel to your destination and project that line beyond your destination. If such line intersects with a bubble anywhere no more than 500 km from your final destination you will be either stopped or dragged to the edge of such bubble. (Yes! Dragged beyond your destination! Bubbles situated in this way are commonly referred to as drag bubbles.) Looking at the diagram below you can see what trajectories make you susceptible to being dragged by a bubble – as long as your final destination is less than 100 km from the intersection of your trajectory with a bubble (otherwise you will fly right through a bubble as if it wasn't there). Bubbles will influence you only if they are online when you enter warp. This means that if a bubble is placed (or a Warp Disruptor probe launched, or Warp Disruption Field Generator activated) at your destination after you entered warp you can land right in the middle of it rather than landing on the edge. While all ships can use tackling equipment with great success certain ships have specific hull bonuses that make them into unique tacklin ships. The so called "tackle frigates" are for most the entry point to tackling ships. These ships are fast, agile and have a hull bonus that reduces capacitor usage of webs, points and scrams by 80%. These ships are often used as initial "hero tackle" that flies to the enemy to hold them still while rest of the fleet comes behind. The direct upgrade from T2 tackle frigates are the T2 interceptors. These are all T2 variants of the above T1 frigates. For each ship there exists two interceptor variants: a combat interceptor with damage oriented bonuses and a fleet interceptor with bonus to point and scram range. The interceptors also have reduced signature bloom from MWD and 80% reduction in point, scram and web capacitor usage. The next step up changes the style of tackling completely. Interdictors are T2 destroyers that are able to create a warp disruption bubble for two minutes. After launching the bubble the inderdictor is free to move and even killing the inderdictor will not release the victim from the bubble. But the pilot has to be careful when they launch the bubble as the module has moderate reload time and will also stop friends and even the pilot himself from warping away. Heavy Interdictors are the big brothers of inderdictors. These T2 cruisers field very high tank with their T2 resist profile and additional resist bonus. Their module of choice is the warp disruption field generator. With this module heavy inderdictors are able to put up a warp disruption bubble at will but while the bubble is up the ships propulsion modules become almost useless with 81% reduction in propulsion module effectiveness (though there are ways to take advantage of this). The warp disruption field generator can also be used with eithre disruption or scrambling scripts that turn the module into infinitely strong long range point or scram. The Minmatar and Gallente Recon Ships also receive large bonuses to specific types of tackling. The Minmatar recons receive massive 60% bonus to web range per skill level in Recon Ships while the Gallente recon cruisers receive equally frightening 20% bonus to warp disruptor and warp scrambler range. In addition to the T2 ships there also exist wide variety of pirate ships with tackling related bonuses. The Mordu's Legion line of ships all receive 10% bonus per level in relevant Gallente ships to warp disruptor and scrambler range. While rarely used as fleet tackle the extended range on these ships allows for kiting outside the enemy's effective range. The Serpentis line of ships receive 10% bonus per in relevant Minmatar ship to stasis webifier effectiveness. The Blood Raider Covenant line of ships receive 20% bonus to web range per level in relevant Minmatar ship skill. Rarely used for their web bonus these ships are usually fitted for energy neutralizing. Afterburner As fitted to military jet fighters, afterburners can be fitted to ships in EVE Online. The afterburner increases your sub-warp speed by a percentage. The afterburner is used by tacklers to close the range to the target faster, to achieve a lock or to get into orbit range quickly. The Tech 1 module boosts your speed by 112.5% (thus it doubles your speed plus another 12.5%). The Tech 2 version boosts your speed by 135%. Microwarpdrive The microwarpdrive is a small warpdrive capable of giving a significant speed boost to your sub-warp speed. It's an upgraded version of the afterburner. Just like the afterburner, the microwarpdrive is used to close the range to the target quicker. A downside of the microwarpdrive is that your signature radius increases significantly, by 500%. Therefore, you will be much easier to hit while using it. While in a tech 1 frigate, only use the microwarpdrive for getting closer to the target. Once you've reached orbit distance, turn it off. Microwarpdrives use more capacitor to run than afterburners and fitting a microwarpdrive, whether it's active or not, reduces the total capacity of your capacitor. Both tech 1 and tech 2 modules give a 500% speedboost to the sub-warp speed of your ship. The advantage of the tech 2 module is a smaller reduction in the capacitor penalty: the tech 1 module reduces your capacitor capacity by 25%, the tech 2 module decreases it by 17%. To be effective as a tackler you first need to get a lock on the target you want to tackle. Every ship has a certain scan resolution, visible in the fitting window, which, together with your target's signature radius, determines the time it takes to lock a target. With a sensor booster you can increase that scan resolution which enables you to decrease the lock-time and so point or scram the target faster. The tech 1 version of the sensor booster boosts your scan resolution by 25%, while the tech 2 version boosts it by 30%. Sensor Boosters also increase your maximum targeting range, but that's less relevant to tackling. If you put a scan resolution script in the sensor booster, the scan resolution bonus doubles and the bonus to targeting range disappears. So you can get a 50% scan resolution bonus from the tech 1 booster and a 60% from the tech 2 version. Overdrive Injector System As a tackler, speed is important in order to reach your target quickly. The faster you can get into targeting and warp disruption range, the faster you can tackle the target. The nice thing about overdrive injector systems is that they don't require powergrid or CPU. The downside of the overdrive injector system is that your cargohold m³ will decrease. As a tackler you do not use your cargohold, so you can ignore that penalty. The sub-warp speed increase of the tech 1 overdrive injector system is 10.4% (with a cargohold penalty of 15%), and the tech 2 module gives a 12.5% increase speed (and a 20% cargohold penalty). Nanofiber Internal Structure This is another module that increases your speed. Unlike the overdrive injector, however, it also makes your ship more agile. Using this module will help you keep a closer orbit at a higher speed making you harder to track, and thus harder to kill. Like overdrives, nanos don't require any powergrid or CPU. The inertia decrease will help you with the closer orbit. The downside of this module is that you get a lower amount of structure hit points (HP). In a way this doesn't matter, because, generally speaking, tackling frigates tend to die when they're hit regardless of their structure HP. This module works well fitted together with one or more overdrive injector systems. This makes you faster and still allows you to keep that speed in a tight orbit. The sub-warp speed increase from the tech 1 module is 7.84%, with a 13.1% inertia reduction. Your structure HP will be reduced by 15%. The tech 2 module increases sub-warp speed by 9.4%, cuts inertia by 15.8%, and reduces structure HP by 20%. Damage Control The damage control increases your shield, armour and hull resistances, making you much tougher and harder to kill. A very much recommended module for any tackler, this will keep you alive a lot longer than without one, and has no drawbacks. It will also make you much more resistant to smartbombs and drones, two major threats to tacklers. The tech 1 module increases shield, armour and hull resistances by 7.5%, 10% and 50% respectively; the tech 2 module increases them by 12.5%, 15% and 60% respectively. Medium Shield Extender A medium shield extender is a great way to significantly increase the hitpoints of your tackler without slowing you down. While high speed will reduce the damage that you take, it will only reduce it - fitting modules to increase your HP will keep you alive and able to tackle for much longer. While a small shield extender will be easier to fit, a medium extender provides far more HP and is generally preferred. You may need to use a Micro Auxiliary Power Core in order to provide the powergrid to fit one. A Tech 1 medium shield extender gives you an additional 750 base shield hitpoints (most frigates have between 350 and 500 shield hitpoints to begin with, so that's a huge difference). A Tech 2 medium shield extender increases your base shield hitpoints by a huge 1050 HP! Warp scrambler or warp disruptor? The primary role of any tackler is to make sure a target ship doesn't run away. The most important part of this is to prevent the enemy from warping off, which can be accomplished by using a warp disruptor or a warp scrambler. Each of these modules has its advantages and disadvantages, and an effective fleet will have some of both. The warp disruptor has more than twice the range of a warp scrambler (20km with the Tech 1 module, or 24km with the Tech 2 module) which allows the tackler to keep more distance from their target. This can increase their survivability against targets with stasis webifiers and energy neutralizers, although orbiting at warp disruptor range (rather than orbiting as close as possible) will make them easier to hit with turrets. It means the tackler can can also tackle the target faster because they don't need to get within 9 km or even less first. Warp disruptors take a lot of capacitor to run and can quickly drain a frigate's small capacitor if you keep them turned on. For this reason, warp disruptors are generally used to get the initial tackle and smart tacklers will turn them off once someone else has put a warp scrambler on the target. Warp disruptors are especially popular on specialised Tech 2 interceptors, which receive bonuses to their range and a reduction to the amount of capacitor they use. The warp scrambler has a much shorter range than the warp disruptor (between 7.5 and 9km), however it doesn't just prevent the enemy from warping off - it also shuts down their microwarpdrive. Since almost all ships larger than frigates will be running a microwarpdrive, a warp scrambler will slow them down significantly. This allows the rest of the the tackler's fleet to get in range of the target more easily, and prevents the target from running away or getting back in range of a stargate. For this reason, having at least some warp scramblers is is essential to any fleet. Warp scramblers use significantly less capacitor than warp disruptors, and so it should be possible to keep them running indefinitely. Using a warp scram will put the tackler within range of stasis webifiers and energy neutralizers which can be a threat to a frigate, however guns will struggle to track a frigate at this range meaning in most cases the tackler will actually be safer in warp scrambler range than outside of it. In most situations, the safest place for a frigate to be is orbiting as close as possible - between 500m and 2500m. Using a warp scrambler puts the tackler quite close to smartbomb range (which is 5km, or 6km if the target is using Tech 2 smartbombs). They need to be careful when engaging a target that is likely to be equipped with smartbombs (i.e. battleships in low security space). If the tackler suspects that the target might be using smartbombs it's a good idea for them to set their orbit between 6 and 7.5km, which should put them safely outside of their range. At first glance you might think that both of these modules perform the same function - both increase your speed, and since the microwarpdrive increases your speed more it must be the better choice. Like many things in EVE Online, it isn't quite that simple. A microwarpdrive has a couple of serious drawbacks. The most important one is that while the module is activated it will increase the ship's signature radius by up to 500%; this will make it much easier to hit and will cause the ship to take a lot more damage from cruiser sized and bigger weapons. This will massively increase the tackler's chances of dying. Also, the microwarpdrive uses a lot of capacitor and the tackler will most likely not be able to run it for an extended period of time. For these reasons, an microwarpdrive is used only to get into range of the target and should be turned off once the tackler are in range to tackle the target. Once that has happened the tackler will only be able to orbit their target at the regular speed of their ship. Also keep in mind that a player will not be able to use the module at all when someone is using a warp scrambler (not a warp disruptor) against them, since these disable microwarpdrives. An afterburner on the other hand does not increase the ship's signature radius at all and it needs far less capacitor, meaning a tackler can keep it activated even while they are orbiting their target. Since they are able to travel more quickly without increasing your signature radius, an afterburner will decrease the chances for the opponent's turrets to hit the tackler as well as reducing the amount of damage they receive from missiles. While an afterburner is not as useful for chasing targets or getting into range, it does help the tackler survive once they get there. To summarise, an microwarpdrive will let the tackler get into range quickly, but they will be more at risk once they get there. With an afterburner the tackler will take longer to get into range, but will take less damage once they do. In most cases, it is recommended that tackler frigates fit a microwarpdrive in order to close range more quickly and to help them catch up with fast moving targets. However, flying with an microwarpdrive is less forgiving than using an afterburner since things will happen more quickly - the tackler will need to be more aware of the range to their target and whether their microwarpdrive is currently turned on or off. If a tackler is trying PVP for the first time, an afterburner might be an easier choice. It is possible to fit both an afterburner and a microwarpdrive to a ship (known as 'dual propulsion' or 'dual prop') if the player has enough midslots as well as the CPU and PG to do so - this is popular on some Tech 2 and faction ships, but is difficult to do on most Tech 1 frigates and is not recommended for new players. Tech 2 interceptors (and to a lesser extent Tech 2 assault frigates) receive bonuses to microwarpdrives which reduce the signature radius penalty which they provide. As a result, they take much less damage when running microwarpdrives during combat. Long-ranged 'fleet' interceptors in particular will often keep their microwarpdrives on for the whole duration of a fight. After the tackle and propulsion module, the most important thing to fit on a tackler is tank - it's no use catching a target if they can simply kill the tackler and escape. You'll sometimes see people fitting their tackling frigates with all speed modules and no tank. The most common place that you'll see these is on killboards, killed in droves by whatever they were trying to tackle. While speed is important, a tackle frigate should already be fast enough to catch most ships in the game (especially if you're using a microwarpdrive) and enhancing that further is not the main priority. No matter what else they do, a tackler should almost always fit a damage control in one of their low slots. This module can massively increase your effective hitpoints and has almost no drawback (it uses quite a lot of CPU, but that's it) - there is very little excuse not to use one. After that, the tackler has two options - they can either fit a shield tank or an armour tank. A shield tank is usually the best choice for a tackler, providing they have enough mid slots to fit one (they will need at least three - one for the microwarpdrive or afterburner, one for the scrambler or disruptor, and one for the tank). This is because a shield tank does not slow the tackler down, which lets them get in range of the target more quickly. An ideal shield tank for a tackler frigate is a single Medium Shield Extender (this gives much more HP than a small shield extender, and it is possible to fit one on most frigates - new players will probably also need to fit a Micro Auxiliary Power Core to provide the necessary powergrid). They may also want to fit shield resistance rigs, such as a Small Anti-EM Screen Reinforcer - these are very cheap compared to other rigs, and will further increase the toughness of their ship. Fitting a shield tank will increase the tackler's signature radius slightly (making them a little easier to hit), however this is vastly outweighed by the increase to HP that it provides. If the tackler can't fit a shield tank, an armour tank is also a possibility. Fitting an armour plate will slow the ship down, but the extra HP it provides can make a big difference particularly if they also fit armour resistance modules (such as an Adaptive Nano Plating). A 200mm Reinforced Steel Plate is usually the best choice - smaller plates do not provide enough HP to be worth it, while larger plates will slow the ship down too much. Armour rigs are generally not recommended on a tackler since they will slow the ship down too much - speed or agility rigs are usually a better choice. An armour tank is best used on close range tacklers with warp scramblers and/or stasis webifiers, since these are less reliant on speed for survival. Most of the time, the tackler will want a buffer tank (HP and resistance modules) rather than an active tank (armour repairers and shield boosters). This is because a small armour repairer or small shield booster generally does not repair quickly enough to counteract the amount of damage they are likely to take if they are getting shot at by another player - the tackler will generally survive for longer with a buffer tank instead. That said, some armour tanking tacklers may choose to fit a small armour repairer instead of a plate since doing so does not slow the ship down, and can still be helpful if they are only taking a small amount of damage. In addition to the actual hitpoints, the high speed of the tackler frigate should help reduce the amount of damage that they take. It generally does not reduce it enough to prevent damage entirely - even on a specialised Tech 2 interceptor - however combined with a few tanking modules it should keep them alive for longer. If the tackler has any low slots or rig slots left over after fitting the tank, it's a good idea to fill them with modules which enhance the tackler's speed (such as Overdrive Injectors or Small Auxiliary Thruster rigs). To fit a stasis webifier or not? Stasis webifiers are great modules as they significantly decrease the speed of a target ship. Stasis webifiers are fairly short ranged, with a range only slightly longer than a warp scrambler. This makes fitting a stasis webifier a good decision if the tackler is already fitting a warp scrambler, since they will be operating well inside webifier range anyway. If the tackler is fitting a warp disruptor, the decision is slightly less clear cut. They first need to decide whether they plan to fly inside stasis webifier range; despite the fact that they have a long ranged warp disruptor, the tackler will generally be harder to hit if they orbit as close as possible, and they may want to fly inside web range anyway. If they do, fitting a stasis web makes a lot of sense. On the other hand the tackler may want to stay outside of stasis webifier range, either because they are flying a Tech 2 interceptor which will be running its microwarpdrive all the time, or because they want to avoid their target's webs and energy neutralizers. If this is the case, there's not much point fitting a stasis webifier since the tackler is unlikely to be in range to use it and they would be better off using that mid slot for a different module (for example a sensor booster to help them lock faster, or a tracking disruptor to protect their fleet-mates from the opponent's turrets). To fit a sensor booster or not? Sensor boosters increase the scan resolution of the tackler's ship and thus allow them to lock a target faster and/or the increase the locking range of their ship (depending on which script is used). A sensor booster makes sense if the tackler is fitting a warp disruptor, however it should not take precedence over tanking modules such as shield extenders. Sensor boosters can increase either the tackler's targeting range or their locking speed (or both) depending on which script you load them with. While most frigates can already lock further than maximum warp disruptor range (20-24km), the additional targeting range from a sensor booster can come in useful by allowing the tackler to start locking a target while they are still approaching them, and before they get into warp disruptor range. This means they can turn on your warp disruptor as soon as they get into range, instead of having to wait while they lock them first. The additional scan resolution will let the tackler lock targets faster, although a frigate will already lock pretty quickly. This is mainly useful when trying to catch targets coming through a stargate. Long range or short range weapons? In most cases a tackler should fit short range weapons for a couple of reasons. Obviously if their ship is designed to be used at short range (warp scrambler/stasis webifier) fitting long range weapons makes very little sense. If their ship is designed to be used at long range they still should consider using short range weapons to fight off drones that are attacking them as well as enemy ships that manage to get too close. The problem with fitting short range weapons to a long range tackler is the temptation to get within weapon range on the primary target so the tackler can apply some damage to it. Quite often they might get away with this, but eventually they will end up getting themselves killed for doing that because they got within range of smartbombs, stasis webifieres and other modules that ruin their day. So make sure to use the modules and weapons as they are intended to be used. Long range weapons really only make sense if for whatever reason the tackler needs to be able to hit their target from a distance. For example, if they are fitted for long range tackling while they are in a small gang and the fleet needs as much DPS as possible or if they are in a frigate only fleet. In a regular fleet the damage from a Tech 1 tackling frigate is usually very small and should not be the priority; the tackler's main concern should be to tackle the target and stay alive. Of course with a large number of tacklers all those small amounts do add up, so there's no reason to not use the high slots if the tackler has some CPU and PG to spare. For a lot of frigates it makes sense to use projectile turrets (autocannons or maybe artilleries) even though the ship might not give any bonus for them. Projectile weapons do not use any capacitor and ACs also require very little CPU and PG. Hybrids and lasers only make sense if your ship grants a reasonable bonus to damage, range or maybe tracking. Tech 1 or Tech 2 modules? Using Tech 2 modules will improve the tackler's performance, however they require somewhat better skills and are a lot more expensive and for some modules it might not be worth it on a Tech 1 frigate. Keep in mind that there are so called named versions of all modules as well (meta 1 to meta 4) which offer more performance than vanilla Tech 1 and are easier to fit as well. The higher meta versions can be very expensive (sometimes even more than the Tech 2 versions), but meta 1 and meta 2 modules are usually very cheap. A Tech 2 warp disruptor offers 4 km more range than any Tech 1 version and requires only one additional level of propulsion jamming, so it's very useful and in fact recommended for long range tacklers if they can afford it. Tech 2 damage controls are also significantly better than their Tech 1 counterparts, particularly because meta 3 and 4 damage controls tend to be very expensive. To fit electronic warfare modules or not? Using a spare midslot for a random electronic warfare (EWAR) module will multiply the value of the ship for the fleet. Especially in a big fleet, there are usually a lot of tacklers and one more or less warp scrambler or webifier doesn't make much of a difference. A tracking disruptor or sensor dampener on the other hand can significantly disrupt the opponent's ability to fight back, even though the tackler frigate does not receive a bonus to those modules. An electronic warfare module can also increase the survivability of a tackler when trying to keep a target tackled for a while until fleet members caught up/warped in, as well as helping out any other tacklers in the fleet. Tracking disruptors are great for this though they are effective only against turret based ships. Most Tech 1 frigates that are used for tackling do not provide any bonus to a specific type of electronic warfare. However, electronic warfare modules such as tracking disruptors and remote sensor dampeners are still incredibly effective on any ship, even one with no bonuses to them. ECM jammer modules are the only exception to this rule, and are not recommended on a ship which does not have ECM bonuses (such as the griffin or blackbird). Some Tech 1 frigates can use at least one small drone and they should utilize that, even if it wont make much difference individually. Not using the drone bay pretty much equals not using a slot on the ship. A simple combat drone like a hobgoblin or a warrior is fine, and if the tackler has trained up their drone skills they could maybe use an electronic warfare drone. Anything is fine really, as long as they use it. None of these skills are actually essential - a player can still be a great tackler without them - but they will make the tackler's life easier and mean a better tackler. Players should train them to IV, if they intend on tackling a lot. They all affect any ship the player flies, so have benefits even if they fly other things. During the fight, a tackler should locate their target and approach them, with their propulsion module running. Once the tackler is in locking range, they should lock the target. When they are in range for their warp disruptor/scrambler they should activate the module. Once the module is activated, they should normally announce to the fleet on mumble that they have a point on the target, so the damage dealing ships can join in. Once the tackler is orbiting the target, they should turn off their microwarpdrive if they have one. When the target is pointed the tackler can also activate their stasis webifier if they have one. In some situations tacklers may want to keep their disruptors "hot" i.e. activated before they have a target. This will enable them to get tackle a bit faster once they have a target. If a tackler does this they should ensure that they have auto targeting turned off int he Options menu, to avoid tackling friendly or neutral targets. Sometimes the fleet commander will call specific targets for tacklers. In the absence of any specific targets, however, tacklers should normally pick a target whose character's name starts with the same letter as theirs, or as close as possible in the alphabet. This will help ensure that the fleet's points are spread amongst the opponents fairly evenly. Pay attention to mumble and try to pick a different target if somebody else has already pointed the opponent you were headed for, or if your designated target is too far away or too fast for you to catch. A ship can initiate warp to any friendly ship that is at least 150km away. If a tackle frigate is 150km away from the main fleet, the fleet can initiate warp using the tackle frigate as a reference point. Note, however, that they do not have to warp to the tackle frigate. The shortest distance that a ship can warp is a mere 50km, by warping to 100km from a beacon 150km away. This leads to another trick for tackle frigates. If they are not actively engaging a pointed target, they should consider burning directly away from it until they are at least 150km from the main fleet. This allows those ships to "warp at range" to the tackle frigate, and hopefully land directly on top of the target. This requires some co-ordination; it's no point everyone burning away and no-one staying to apply point / web / scram. Once a player commits a hostile act, they cannot use jump gates (or dock) for sixty seconds. A canny target with sufficient tank can stop aggressing, wait out their timer, and then jump through the gate and get away. To prevent this happening, most fleet commandeers will reserve a small number of tacklers that do not aggress, so that they also can go through the gate and engage any target attempting to flee. Often these tacklers are sent through first, so they can take up position ready to catch a fleeing ship. In this situation, tank can be important. In the worst case, a tackler might need to hold a hostile ship for the full sixty seconds while their fleet's timers expire, plus another ten or so while they jump and load the grid. This page was last modified on 7 January 2019, at 19:26. This page has been accessed 189,403 times.